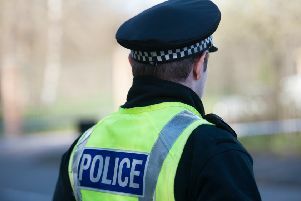 The bomb squad have carried out a controlled explosion of a ‘suspicious item’ on a North Edinburgh street. The item, found on a pavement on the opposite side of the road to the Annandale Street mosque, was reported to police at about 11.50am this morning. One eye-witnesses at the scene say that neighbouring homes have been evacuated and that a funeral has been postponed at the Mosque. They have also described seeing a large police presence of about 8 to 10 cars, and a police cordon has been put up. Bomb disposal experts carried out an initial examination of the package with a remote robot - which then prompted police to extend the safety cordon, closing off all of the surrounding roads. The Explosive Ordnance Disposal (EOD) team carried out a controlled explosion at around 2.50pm. It is not yet know if the object was a viable explosive device. After the explosion, members of the bomb disposal team, wearing black protective clothing, were seen scouring the area around the robotic vehicle with torches. Eyewitness David Laird, a 30 year old business owner from East Pilton who works in the area, said: “The police just kept moving everyone back so it seems fairly serious. They evacuated all the homes really quickly and then pushed the cordon back again. The street was reopened at about 4.30pm.